GRAND RAPIDS, MI – More than 50 sport courts around the city will get repaired, resurfaced or rebuilt this spring with money from a voter-approved parks tax. 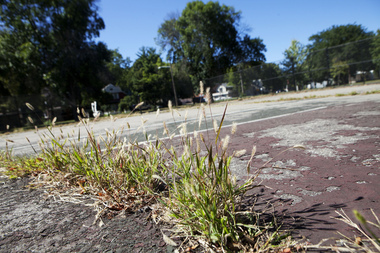 In some cases, existing tennis courts will be re-purposed for other games, city records show. The $1.8 million project is scheduled to come before Grand Rapids City Commission on Tuesday, Jan. 27. Rockford Construction Co. is the low bidder and recommended contractor. The city plans to convert three tennis courts at Plaster Creek Family Park, 2512 Buchanan Ave. SW, and two tennis courts at Campau Park, 50 Antoine St. SW, into fields for futsal, a kind of soccer game. A tennis court at Belknap Park, 30 Coldbrook St. NE, would be turned into two pickle ball courts. “We’ve had a lot of interest in those areas of the city to have futsal courts instead of tennis courts,” said Connie Bohatch, the city’s director of community services. Futsal courts also are included in new designs for Garfield and Lincoln parks, which are among eight Grand Rapids parks slated for major capital improvements with millage money this year. Grand Rapids voters in November 2013 approved a 7-year, 0.98-mill property tax for parks. The tax is projected to generate about $4 million annually for parks. The city started collecting the millage in July 2014 and through the end of the year had spent $1.3 million of the money, Bohatch said. The millage money so far has been spent on city swimming pools, which were open last summer for about five weeks longer than in previous years. The city also has put in new playground surfaces and trimmed hazardous trees in several parks, and begun making repairs to several park buildings. Grand Rapids has also started installing new drinking fountains in 28 parks. Starting next week, the city’s parks and recreation director is expected to begin work in Grand Rapids.